The Status Bar. Important information and control of various states, plus access to the Gallery, Drawings, Settings, the Pro Shop and Help. The Tool Wheel.Eight of your favorite tools, each configurable, plus undo and redo. You can change this into a Tool Bar on the side, if you prefer. Color Palette & Mixer.Configurable, on-canvas palette. Precision Tools.Grids, Snap, Measure, and Shape Guides to help you be precise. Layers.A way of organizing your drawing, separating tools, or achieving a specific look. Automatic or manual. Export.Send your drawings anywhere in many different formats. Import.A combined menu with objects and external assets. Like a library. Much like the Gallery, the Canvas has a persistent Status Bar that displays and controls information relative to your current state. The Gallery button is the grid on the top left - tap it to close your drawing and find or start another one. 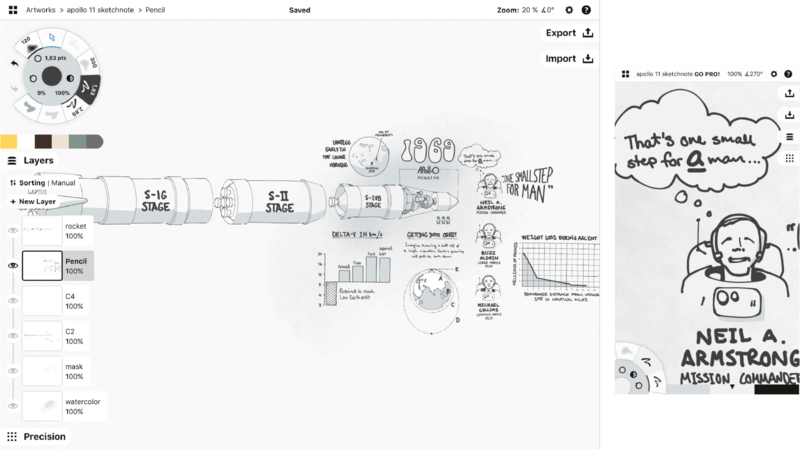 The Breadcrumb trail is next, showing what project, drawing, and layer you’re currently in. Tap+hold any of these to quickly rename them. 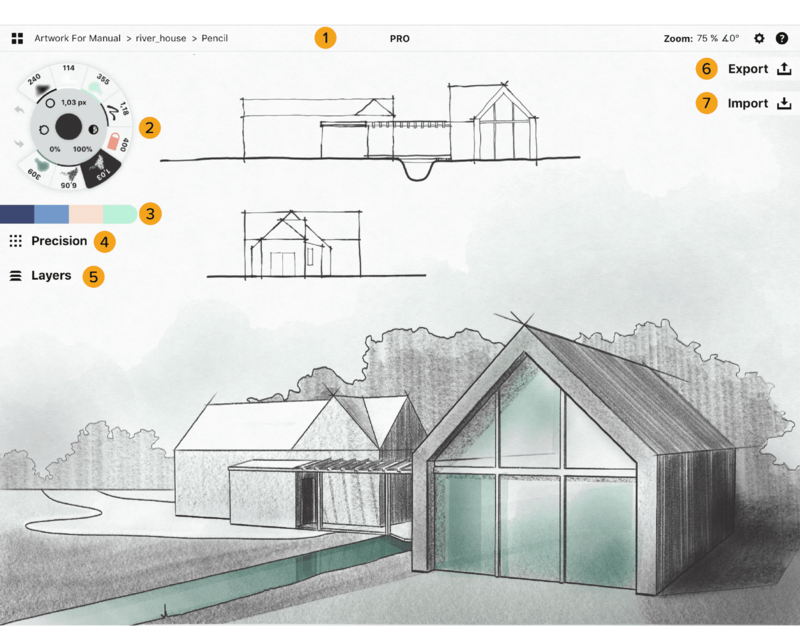 Just like in the Gallery, you can tap a menu to bring up a list of your drawings inside a project and navigate immediately between them. You can also tap on the project name to display your full projects list, select an alternate project and access its drawings instantly. Drop down menu for access to Drawings in the current project, via the Drawing breadcrumbs. Access drawings in other projects by tapping the Project breadcrumbs. In the middle is the status indicator. It’ll normally say “Go Pro” or “Pro” (which links to the in-app store), but will change to various states like “Saving” or “Rendering” when appropriate. You’ll also see an animated blue strip just below the status bar when Concepts is working. The zoom / rotation info helps you retain a reference to the canvas state - it’s easy to feel lost sometimes. You can tap+hold these values to set them to something specific. This also applies when you have a selection and want to fine-tune measurements and get things just right. Double-tapping on these values resets them back to default. 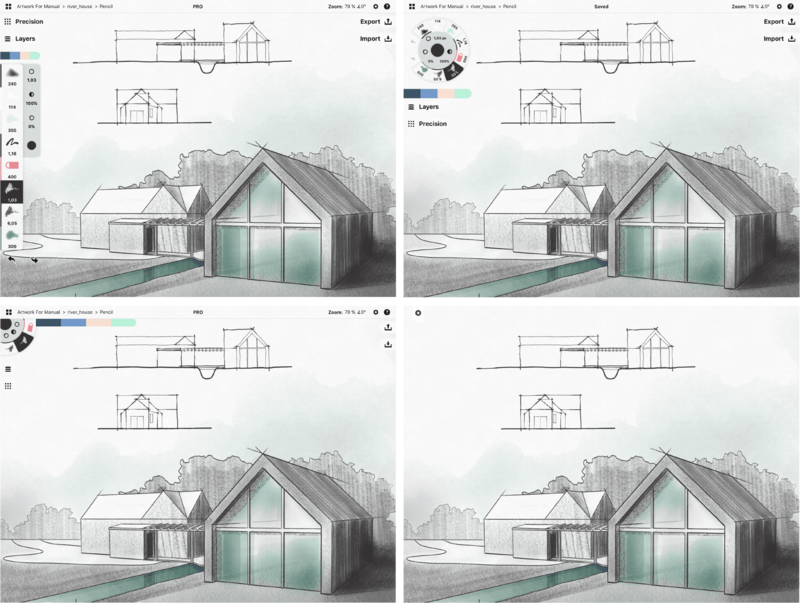 The Settings button lets you access workspace-specific settings like your paper type, artboard size and units + scale, as well as gesture and stylus configuration options. See Settings to learn more. Help is always a tap away via the question mark. You can find many different resources there, including the ability to Ask Us Anything directly from the app. Work on the bigger picture or zoom in to focus on the details. With the infinite canvas, there are no boundaries unless you set them yourself. Concepts is equipped with an infinite canvas, which is our way of saying you can extend your paper in any direction you need it, as far as you need it to go. You can pan around using two fingers normally, or one finger while using the Pan tool. 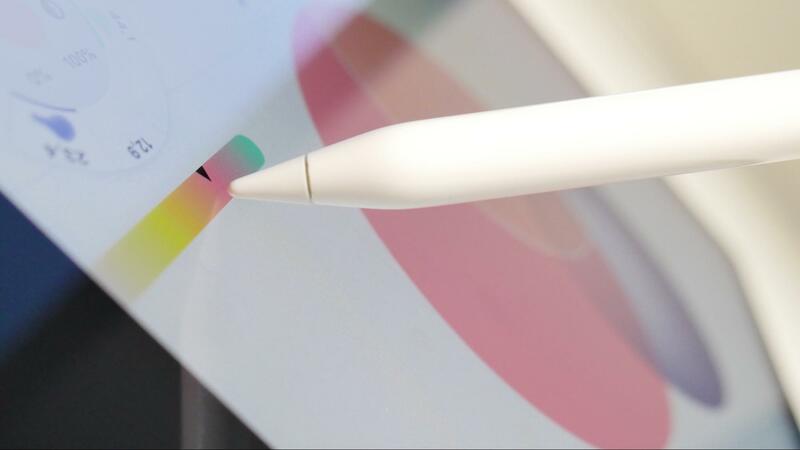 If you’re using an Apple Pencil, you can set your Finger Action to pan around as well, which makes navigating while drawing more convenient. To zoom in and out, or to rotate the canvas, use a two finger pinch / spread gesture. Lines stay sharp no matter how far you go - one of the many benefits of a vector-based platform. You'll notice there are "zoom steps" at common increments which help you find standard sizes and rotations by feel. For a more precise level, tap+hold the zoom/rotation values in the Status Bar. If you move far away from your drawing, you'll see some pointers appear on the outside edges of the screen. Tap one to quickly navigate to the closest off-screen stroke. Of course, you can add a predefined boundary or artboard to your infinite canvas, too. Just go to the Settings menu and define your custom size or choose from the popular choices. Tap+hold a corner of the artboard to move it about - handy for framing your drawing just so, cropping images into an exact size, and getting a reference for how big / small your drawing is based on real-world scale. When you Export, you can choose to capture the image according to the artboard’s sizing. Every designer works differently, so we’ve made your workspace customizable. Every menu on the screen can be moved to where you want it, to maximize your canvas space and comfort. To move a menu, tap+hold+drag it. To move the tool wheel, tap+hold+drag the outer ring of the wheel (as the center and middle rings bring up other menus). A map of possible zones will appear to help guide you. Let go when it’s where you want it. The menus can stack in the same port, just drag a menu up or down to rearrange their order. The tool menu will appear as a tool wheel in any corner. It can be docked way up into the corner as a spinnable wheel to maximize your canvas space, or if you drag it to either edge of the screen, it will change to a more classic tool bar. You can also define your space with three different modes - normal, compact and hidden. In normal mode, all the menus are visible and the tool wheel is completely on canvas. You can enter compact mode by swiping outwards on the canvas menu buttons. This minimizes the labels into simple icons and docks the (spinnable) tool wheel into the corner. To hide everything for a full canvas workspace, swipe outward one more time on any of the menu buttons. Just touch the dot visible on the edge of the canvas to bring them back. You can also configure one of the tap shortcuts to toggle hidden mode, see Gestures to learn more. The focal point of the Concepts interface is the Tool Wheel. 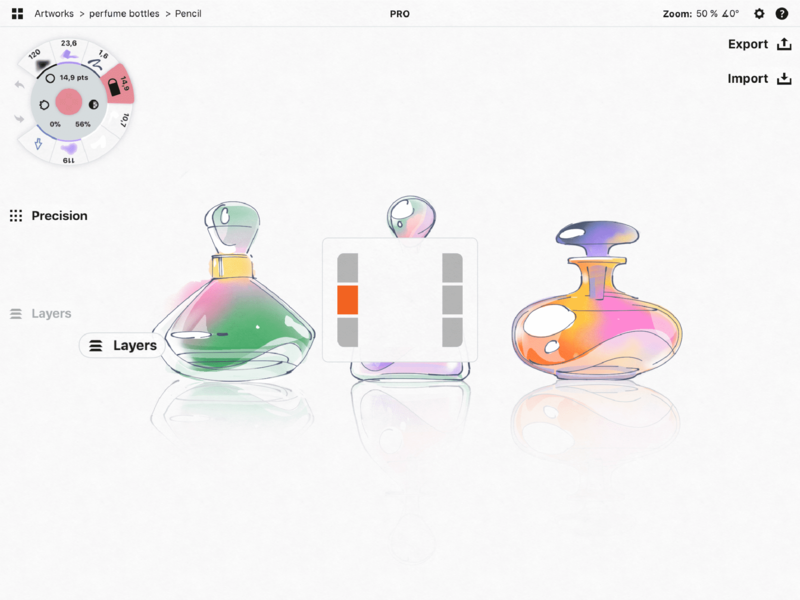 This is where you access your favorite tools, configure them, and choose your colors. The outer ring contains your tools - eight completely customizable tools of your choice, plus undo and redo buttons. 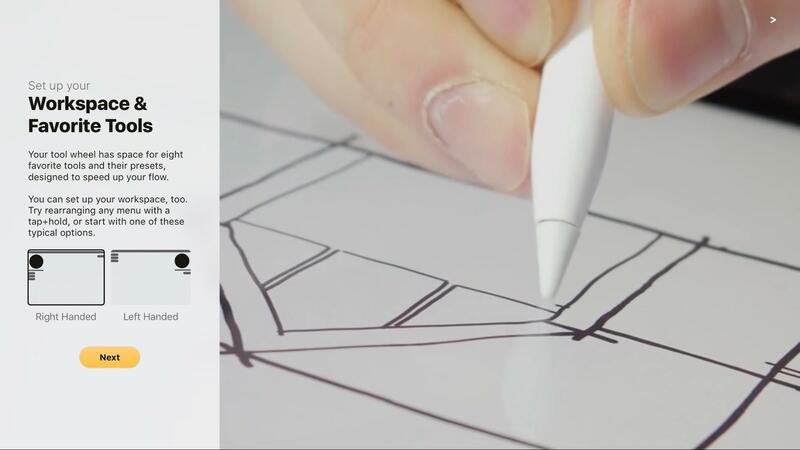 Tap a tool to activate it and draw with it. Tapagain to bring up a Brushes menu, where you can choose among the different brushes and set your tool's presets. The middle ring contains shortcuts to your brush size, opacity, and smoothness. Tap one to bring up a slider and find your tool’s presets. Select a preset by tapping on it, then drag your finger along the slider to set its value, or tap+hold the preset value to manually enter a new value. Tap again to dismiss the menu. If you want to adjust the size, opacity or smoothness values quickly in flow, just tap+hold+slide on any of the shortcut buttons to adjust immediately. The slider will open as you slide it and close as soon as you lift your finger from the screen. 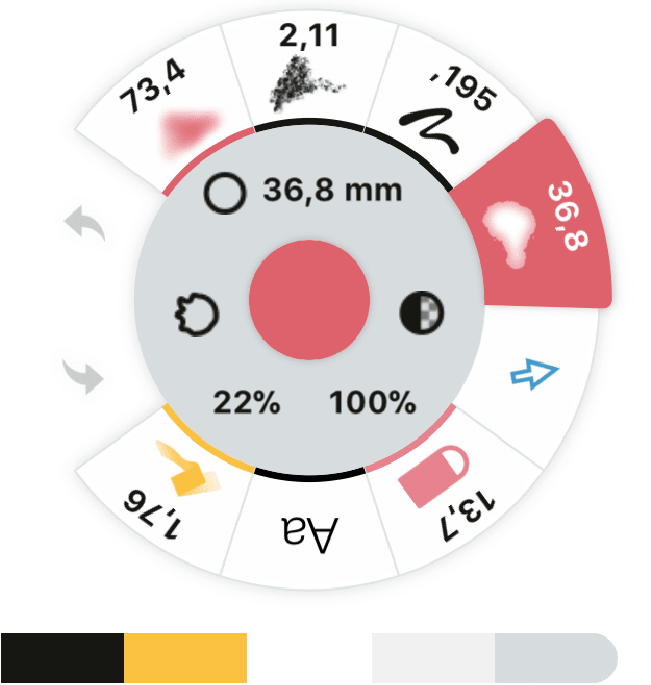 The innermost circle inside the tool wheel displays your current color and its opacity. Tap the circle to bring up the COPIC color wheel and find the color picker. Tap+hold the circle to bring up your Colors menu, which is where you can customize your color palettesandcolor mixer. If you drag the tool wheel to the right or left edge of the screen, it will become a tool bar. The same abilities are available with the tool bar as with the tool wheel, with the customizations and color options available along the inside edge. Some people prefer their buttons larger or smaller to fit their fingers. You can scale the tool wheel by pinching or expanding your fingers on it, and find the size that is most comfortable for you. Mistakes can be wonderful, but sometimes they're not. In case you need to take a step back and change something, you can always use the undo and redo buttons. The buttons are on the outer ring of the tool wheel or beneath the tool bar. But you may use them less than you think. You can configure gesture shortcuts for undo and redo in Settings under Gestures. Our most popular setting is a two-finger tap to undo, to the point we’ve heard our designers wail about not having a two-finger undo on a normal piece of paper. You can also configure shortcuts for undo and redo on any of the supported active styli that have physical buttons. Again, check out Settings to configure them. But the biggest reason you might not use undo so much is that we’re vector-based, which means you can Select and adjust the offending line, or delete it entirely whenever you want. This is a selective way to alter your sketch (no pun intended) without being limited to a brute force undo that loses all of your latest work. We think you'll prefer it. Below the tool wheel is a color palette aka the Color Mixer. This mixer is scrollable left and right, and can be customized from your Colors menu. Any palette you activate in the Colors menu will appear on screen in this mixer, in the order you tapped them in. As a mixer, it also has the ability to blend your chosen colors, allowing you to choose complementary shades inside your palette. Tap+hold on the mixer to activate this feature, then slide your finger or stylus to the left or right, and let go to select your preferred color. You can add this complementary shade to your palette from the Colors menu. Learn more in Colors. Apple Pencil (iPad Pro only). This is by far the best experience, as latency is very low and you get native hardware support and tilt/pressure response on supported tools. 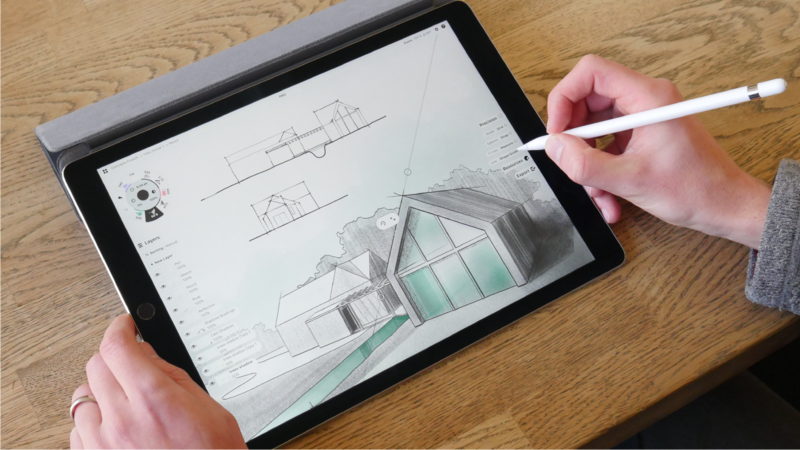 You also get the ability to separate Finger actions from Pencil actions, allowing you to draw with the Pencil and perform a separate action with your finger. These extra actions include: Do nothing (for extra robust palm rejection), Use active tool (the default), Nudge, Pan Canvas (to move around with a single finger vs. the standard two-finger zoom/pan), Select (a quick way to make selections), and Configured tool (8) (the final tool beneath the redo button on the tool wheel, i.e. whichever tool you’ve selected for slot 8). Adobe Ink. An older stylus that is no longer supported by Adobe. We support it for the moment but don’t recommend it. Adonit Jot Touch, Script and Pixel. These are quite good for older iPads or any iPhone model. The Script doesn’t support pressure sensitivity. Pencil by 53. While thicker than some, this doesn’t require a bluetooth connection (in a pinch) and is very comfortable to hold. Pogo Connect, first and second generation. All Wacom Styli. Long an industry standard, Wacom hardware is reliable and well-supported. The shortcut buttons on some styli can be configured once the pen has been connected. Buttons can be configured to: No Action, Undo, Redo, Select Last Item, Show Layers, Show Color Wheel, Tool Setup, Show Objects. Note when using Palm Rejection: Make sure you turn off “Multitouch Gestures" in the device’s Settings app (under General). If you don’t disable it, it will cause conflicts and the screen will jerk around a bit. Concepts works great for lefties and righties. While the app gives you some default options the first time you launch, they’re really just suggestions - try moving the tool wheel to the opposite side of the screen and watch the menus switch orientation. Move your menus where they won’t be in the way.